Railpictures.ca - John Pittman Photo: CP 8939 (ES44ac) displays the name Strathcona and emblem of a Canadian Armed Forces Regiment, Lord Strathcona’s Horse (Royal Canadians). Assisted by CP 8834 (AC4400), train 246 is southbound on the east main track of the CP Hamilton sub alongside the Aberdeen wye, heading toward the Hunter Street tunnel. Scottish-born Canadian businessman Donald Smith, 1st Baron Strathcona and Mount Royal, was co-founder of the Canadian Pacific Railway and the man who drove CP’s last spike. A man of many interests and talents, in 1900 at his own expense he raised and equipped “Strathcona’s Horse” for service in the South African War. CP has a continuing connection with the regiment. Strathcona as a street, town, or district name exists in multiple places in Canada, including the northwest Hamilton neighbourhood that the front of train 246 has just passed out of. | Railpictures.ca – Canadian Railway Photography – photographie ferroviaire Canadienne. Caption: CP 8939 (ES44ac) displays the name Strathcona and emblem of a Canadian Armed Forces Regiment, Lord Strathcona's Horse (Royal Canadians). Assisted by CP 8834 (AC4400), train 246 is southbound on the east main track of the CP Hamilton sub alongside the Aberdeen wye, heading toward the Hunter Street tunnel. Scottish-born Canadian businessman Donald Smith, 1st Baron Strathcona and Mount Royal, was co-founder of the Canadian Pacific Railway and the man who drove CP's last spike. A man of many interests and talents, in 1900 at his own expense he raised and equipped "Strathcona's Horse" for service in the South African War. CP has a continuing connection with the regiment. Strathcona as a street, town, or district name exists in multiple places in Canada, including the northwest Hamilton neighbourhood that the front of train 246 has just passed out of. 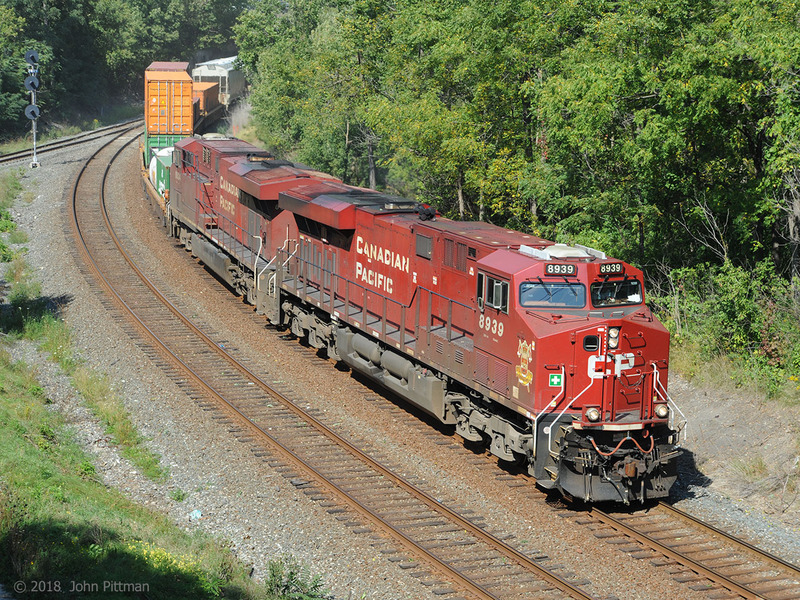 Correction: CP 8834 is another ES44ac. I’d be interested to know of any other CP engines with Strathcona badges, or other current special emblems.